Being the last batch of graduate from the old Nanyang University (南洋大学), Siew Noi is effectively bilingual. Driven by strong interest in teaching children in Sunday School, she seeks all opportunities to learn about creative teaching skills to children. She completed a Certificate course on The Practices And Principles Of Children’s Ministry. Siew Noi was one of the early batches of Diploma graduate from the Singapore Confucius Institute at Nanyang Technological University (南洋理工大学孔子学院) where she obtained a Diploma in Teaching Chinese Language (汉语教学教育专业文凭). Her pursuit in the Singapore Confucius Institute also earned her Basic Chinese Teaching Certification (快捷汉语 – 基础级核心教程教师资格证书课程) and Immersion Program Certification with China Shandong University International Education Institute (山东大学国际教育学院). 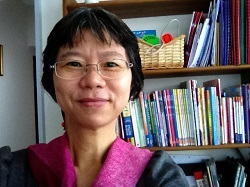 Siew Noi is a Certified Conversational Chinese Instructor with Singapore Eduation Curriculum Development Board (新加坡教育部课程规划与发展 – 华语会话培训班). She is also a certified teacher with Ministry Of Education to teach Mandarin to non-Chinese Secondary students. Prior to full time tutoring, Siew Noi worked many years as Relief Teacher with Ministry of Education. She taught in Tao Nan, Tanjong Katong Primary, Geylang Methodist Primary, Eunos Primary, St Joseph Institution Junior and Kong Hwa. She also taught as part-time tutor at Confucius Institute. 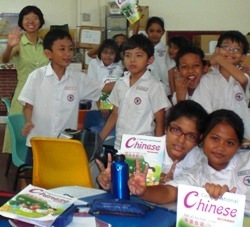 Siew Noi teaches with the purpose of promoting students’ interest in Chinese. With her training on creative teaching, she was able to help many children overcome the fear of learning Chinese. She leads her students through multimedia resources and creative teaching methods to improve their level of Chinese knowledge, especially in the area of Chinese history, culture and values. Under her influence, students often cultivate good habits in listening to Chinese TV news and reading Chinese Newspaper.